Door Construction – Doors are constructed from a heavy duty 22 ounce tear resistant vinyl material. Standard feature includes heavy gauge galvanized steel mounting hardware. Heavy duty ball bearing trolleys provide easy glide operation. Full height, heavy galvanized pipe staffs are placed evenly throughout the door, along with cane bolt floor locking pins, for superior wind stabilization. Manually operated. Bi-Parting door is fixed to both jambs and locks in the center. Leading edges of pipe staffs overlap to give complete seal. Nylon cord tieback straps on the fixed sides which keep the screen secure in the open position. 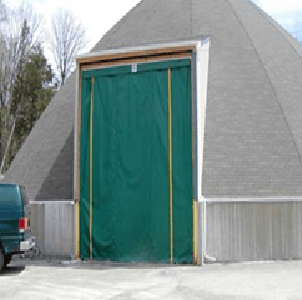 Paylon commercial retractable salt doors offer an economical solution for creating a barrier to protect your salt from moisture, birds, flying debris or intruders. All doors are custom-made to fit your application. All our commercial retractable vinyl salt doors come as a complete kit, custom made for your application. 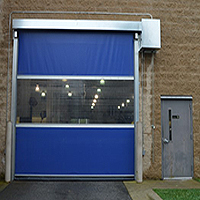 The doors are easy to install and are designed to give many years trouble free operation. 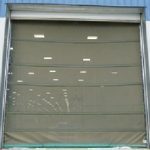 The commercial salt door curtains can be either header or face of wall mounted and come with all the necessary parts for a complete installation. 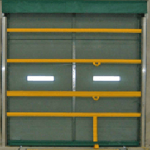 Retractable vinyl salt doors are constructed with high-grade corrosion resistant materials with few moving parts. This will ensure easy installation and provide many years of trouble free service. 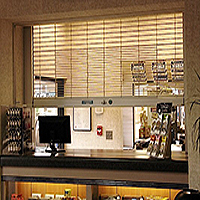 Depending on your door application we offer a single sliding or bi-parting arrangement.